My second design for The Birlinn Yarn Company has just been released! 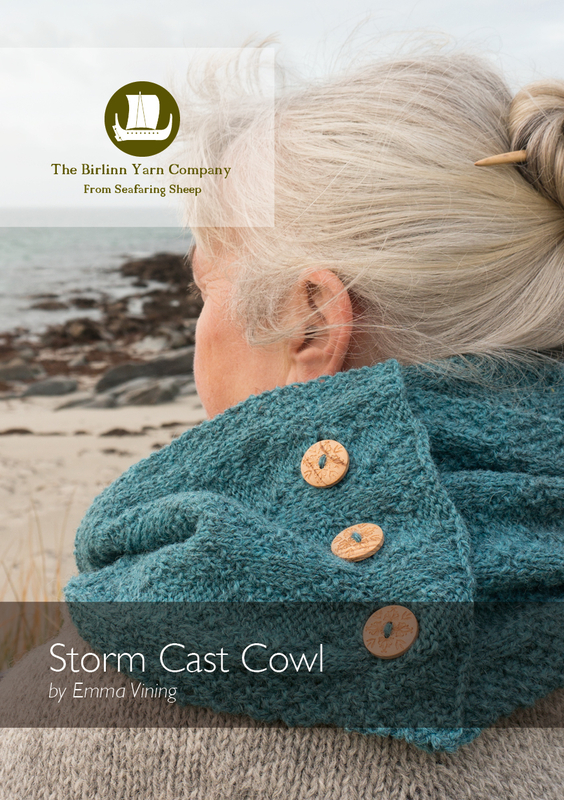 Storm Cast is a double length cowl fastened with three wooden buttons. Knitted as a long narrow scarf, the buttonholes are made within the cast off border. The beautiful blue shade of 4ply yarn is called Reef. "Designed by Emma Vining for Birlinn Yarn, our Storm Cast Cowl is for entry-level knitters. Inspired by seafaring Hebridean culture, the double length cowl is textured by a wave stitch pattern that works across the knitting from edge to edge and reflects the ebb and flow of the tides and storm cast waves. As islanders the sea is a large part of our lives at Birlinn Yarn, even our Hebridean sheep are seafaring. Thus the purity and pared back aesthetic of this pattern reflects this cultural context and the strong, constant rhythm of the tides and waves breaking on our Hebridean shores. My Storm Cast pattern is available as a download from the BYC website and can be purchased along with the gorgeous BYC yarn. The cowl is knitted with three 50g balls of BYC 4ply yarn. Other beautiful natural shades and Hebridean Colours are also available to purchase and the cowl would look amazing in any of them! Machair Wildflower Shawl Pattern is now on sale!